ArtScroll’s 8 Days of Savings continue with our next two daily specials! Some of our best-selling items are being sold at unprecedented prices, so hurry and shop before these savings are gone! Because of shabbos, we’re putting the next two specials up today! 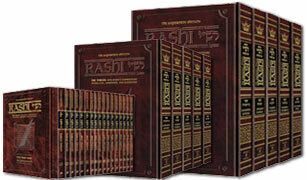 The Torah with Rashi’s commentary translated, annotated, and elucidated. FULL SIZE 5 VOLUME SET (7″x10″) List Price: $149.99 – Now Only $89.99! STUDENT SIZE 5 VOLUME SET (5½”x8½”) List Price: $129.99 – Now Only $77.99! PERSONAL SIZE 17 VOLUME SET (4¼”x6″) List Price: $99.99 – Now Only $59.99! The English Chumash that has become the standard wherever you go! FULL SIZE ONE VOLUME (8″x9½”) List Price: $54.99 – Now Only $32.99! Hurry! These sales end at midnight on December 20th. Don’t miss this great opportunity!